A Neoclassical country house designed in the 1780s by Sir John Soane, his first private house. Soane also designed the walled gardens and the service courtyard. The hall was substantially altered in the 19th century, and new formal gardens were laid out in 1882. The stables and garden buildings date from the late 19th century. An important country house designed by Sir John Soane in 1783 to 1789, his first private house. Brick with stone dressings and slate roof. Main block is square, 3 bays and 3 storeys, with basement, originally with lower services to the west. The entrance façade was altered in the 19th century by replacing the porch and extending the library. Deep central porch with Doric columns. Above the 1st floor balustrade, the arch of Soane's recessed central bay is just visible. 19th century extension on the east façade with a large Venetian window which formerly led to a conservatory. The services are now around a courtyard to the west. Interior has a fine hall staircase, and original plasterwork and chimney pieces in several rooms. The walled gardens are probably by Soane. Stables are of about 1880, three sides are attached to the 18th centruy walled garden. Giant pilasters and open pediment, with single storeyed side wings. Thatched garden house with stained glass windows to north of hall is dated 1882, when Edward Boardman designed a new formal garden layout. 1970s or 80s. Alan Carter Norwich Survey. See (S2), which includes (S3). T.E. Miller (NLA), 19 April 2006. (S4) notes that Soane designed a number of houses in East Anglia during the 1780s, a period when his mature and refined Neoclassical style was developing. Letton was the first country house designed by Soane, and the outbuildings are an early example of the axial arrangement he later used at other country houses. The Hall is now used as a Christian conference centre. S. Spooner (NLA) September 2005. Hall is grade II*, walled garden and garden house are each grade II. E. Rose (NLA), 11 July 2005. Soane largely reused bricks from the earlier demolished building. E. Rose (NLA), April 2008. D. Gurney (HES), 20 December 2011. --- Aerial Photograph: TF9705 L,M,AC-AM,AQ-AT. --- Newspaper Article: Eastern Daily Press. 1979. Letton Hall has new owner. 13 November. --- Newspaper Article: Eastern Daily Press. 1978. 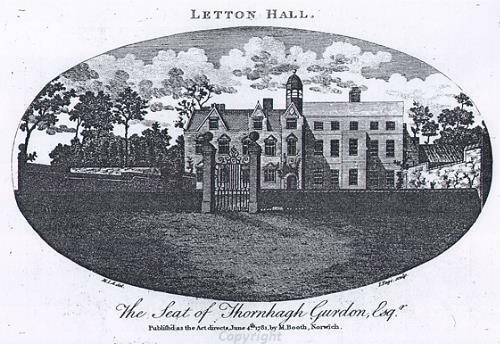 Letton Hall up for sale. 29 April. --- Newspaper Article: Eastern Daily Press. 1982. Gratitude for Hall Aid. 8 July. --- Aerial Photograph: Edwards, D.A. (NLA). 1995. TF9705/AU - AX. --- Aerial Photograph: Edwards, D.A. (NLA). 1996. TF 9605U. --- Photograph: Photograph of Letton Hall gazebo before repair, Letton Hall, Cranworth. Black & white. <S2> Unpublished document: Carter, A.. Building Survey. <S3> Illustration: Page, I.. 1781. Drawing. <S4> Serial: Pevsner, N. & Wilson, B.. 1989. The Buildings of England. Norfolk 2: North-West and South..
<S5> Verbal communication: Wilson, R.. 2008. Lecture by Richard Wilson at UEA..
<S6> Publication: Peter Carroll. 2011. Lives & Loves of Letton Hall, Norfolk. The Biography of Sir John Soane's First House..